Nama executives fought back against claims by the Wexford TD. 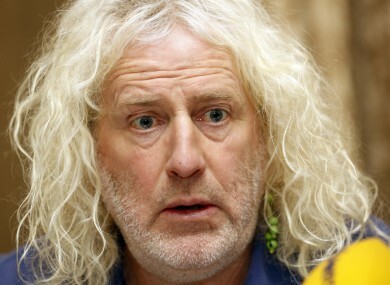 ALLEGATIONS BY MICK Wallace TD about the sale of Nama assets were branded as “utterly disingenuous” by top executives today. The Public Accounts Committee today examined the €1.6 billion sale of Nama’s Northern Ireland property loan book, ‘Project Eagle’. Wallace had claimed that the assets were worth €4.5 billion and that Nama could have sold them for 50% of what they were worth. But Nama’s chairman Frank Daly today said that this was “totally unrealistic” with the average value of the loans just 27% of their original value. “Their focus appears to be very much on the purchase side and what may or may not have taken place in Northern Ireland,” he said. Daly also took issue with media reports he said were “without foundation” and said that anyone who uses privilege to make claims of wrongdoing should pass on “accurate and reliable” information to NAMA. Today’s PAC hearing began with discussions about the decision by Finance Minister Michael Noonan to provide hundreds of pages of documents to the PAC last night. PAC chairman John McGuinness made reference to documents the committee received from Finance Minister Michael Noonan last night. Last night at nine o’clock the minister, Michael Noonan, wrote to the committee and presented 41 documents, running to hundreds of pages, which relate to Nama’s Northern Ireland Advisory Committee and its interaction between the minister both here and in Northern Ireland dealing with Nama related issues. “No advance notice was given to the clerk that such information was being made available,” McGuinness said, describing its timing as “deeply frustrating”. “It goes against good practices of accountability,” he said. Reacting to the release of the information by the minister, Sinn Féin’s Mary Lou McDonald said that the timing “feels like a manoeuvre”. “There’s no issue with documents being published, it’s correct and proper,” she said. “The issue is a matter of the timing and the motivation of the timing. McDonald added that she believed Michael Noonan should appear before PAC, as should Northern Ireland First Minister Peter Robinson. McGuinness also made reference to what he said was an effort to interfere with the work of the committee. He added that the committee has been cautioned about the individuals that they are to consider bringing before them and that they’ve been told that “any aspect of criminality is a matter for the guards”. Independent Alliance TD Shane Ross said that such a warning – reminding them about their standing order – was unnecessary. He then looked towards a civil servant who he says was in the gallery, claiming that he didn’t need to be there. I don’t think this committee needs a civil servant to come in here to tell us that, we knew that. I don’t think this committee needs a civil servant sitting in the gallery, watching what we’re doing either. I don’t understand what he’s doing there. “If that’s meant to intimidate us it doesn’t,” he added. Fine Gael’s John Deasy defended the timing of the release of he documents from Noonan, saying that it can’t be categorised as “an attempt to frustrate the committee”. Speaking later during the hearing, the Sinn Féin chair of Northern Ireland’s Finance Committee Daithí McKay said that the reluctance of Nama to appear before the committee is ‘frustrating’. Both McKay and PAC members noted that Wallace has chosen not to appear before them. Email “Wallace claims about 'Project Eagle' trashed by Nama as “utterly disingenuous””. Feedback on “Wallace claims about 'Project Eagle' trashed by Nama as “utterly disingenuous””.